KoreaTimes Hollywood Bowl is the longest running American annual KPOP concert, boasting of having many of Korea’s top of the top artists. While this was the primary reason MFBTY came to LA, they made the most of their short stay. Our team was lucky enough to document parts of their ventures (with management photos for those moments we weren’t present), and we’re happy to let the fandom live vicariously through our experience. The group arrived last Thursday, May 5th, and while the flight was tiring, they were in high spirits for their upcoming gig. The trio decided to add associate DJ, DJ R2, to their set last minute, adding an interesting scratch combo with their regular DJ, Smells. The brisk LA weather was refreshing for all of them, and a stay in LA always brings about past fun adventures they had in the city (LA is JK’s second home, as he spent most of his childhood there). The staff of KTMF were glad to put them up in one of the fancier hotels in the city, The Millennium Biltmore, an arrangement that is more extravagent than their usual accommodations. Bizzy was more than happy to post the evidence of their fancy stay. While sleep was probably a smarter choice, the trio took to the streets of Downtown LA that night to take a brisk walk. DJ R2 seemed the most excited by his big city visit, but manager, Ryoji, DJ Smells, and Bizzy were glad to show excitement and videobomb R2’s Instagram. The excitement of the city made sleeping tough, but they did not let that show during their rehearsal. The sheer size of the Hollywood Bowl was an eye opener, but no performance at the Bowl is complete without the proper backing images. DJ Smells got the all star entrance spinning around on a rotating stage, backed by images from MFBTY’s “Wondaland” and “Angel.” If you didn’t know who the members were before, you were going to find out from the giant screens. It was soon off to Club Feria, thanks to an invite from the club owners. What was originally supposed to be a quick hello and chill, turned into a night of reunions and an impromptu concert for club goers. The same night, old Movement member, Microdot (from then DOK2 + MICRODOT group, AllBlack), was scheduled to perform. Upon hearing of our family’s presence that night, Microdot made it a point to visit the family for a thorough reunion. The fam jammed to Microdot’s set, very proud to see old fam doing well. However, the big highlight for MFBTY’s fans that night was when DJ R2 decided to take over the turntables, dropping “Monster,” and then convincing MFBTY to take the stage. R2 then played Bizzy’s “ALL I NEED,” giving Bizzy fans the American stage debut of the single. Despite getting rest, the team was still physically tired and anxious for the big show. They were the second to last act, the lead up into Shinee. They stopped for a few minutes prior to put on a positive face for us, even giving us this fun treat. At 9:50PM, MFBTY went on, starting with “ANGEL.” Despite the huge line up of artists, there were a number of fans in the $300 pit waiting just for MFBTY. They gave the predominantly pop line-up a hip-hop twist when they dropped, “Sweet Dream,” then “BangDiggyBangBang,” and SURPRISE-“MONSTER.” Most KTMF performances are 3 songs long, but MFBTY somehow managed to squeeze a bonus song for concert goers. They returned at the end of the show with all the other artists. Rather than simply sing the end song, they decided to make the fan experience even better: for a full 10 minutes, they dropped into the pit, signed autographs, and took pictures with fans. After a long day, the fam went back to their hotel to rest. However, the next day, they reflected on how many fans came out specifically for them amongst a large line-up of artists. Despite given a short set, it was apparent that fans were more than content with finally being able to see one of their rare U.S. performances. MFBTY thanks all fans who came out to this short set. The fam would love to come back for a full on concert of their own soon, and DT MFBTY INTL will be the first to let you know when they do. To see all our pictures from our adventure with MFBTY, see here & here. A few weeks ago, we announced that Tiger JK & Bizzy would be part of the Korea Times Music Festival. However, eager MFBTY fans felt a great void without leading lady, YoonMiRae, and many held out until they knew if she’d join for sure. Well, MFBTY family, your prayers have been answered. An MFBTY show would not be complete without our fierce siren, and she has agreed to complete the trifecta on May 7th. The show will take place at LA’s grand Hollywood Bowl. Other artists included in the line up are Red Velvet, FT Island, and AOA. Still many tickets available on Korea Times Music Festival’s website. Looking forward to seeing you all there! 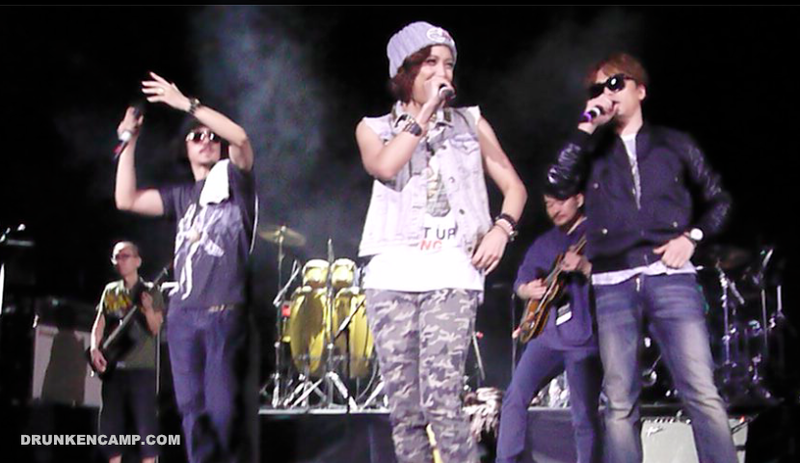 Tiger JK, Yoon Mi Rae, Bizzy–otherwise known as MFBTY–held their first solo Concert at Seoul Hyundai Card Understage on November 20th, 2015. This concert was especially meaningful to them as this was their very first solo concert after forming the project group MFBTY. The fans responded accordingly, with the tickets selling out within hours. The fans ranged from the teens, to the 20’s + as well as lots of international fans confirming MFBTY’s status as a true global group. MFBTY, which stands for My Fans is Better Than Yours rocked the stage harder than ever before with their signature energetic stage presence and this was felt all throughout the crowd. MFBTY started the concert with “Welcome to Wondaland” and Drunken Tiger’s classic, “Do you Know Hip Hop,” creating a huge sing-along. #mfbty #tigerjk #drunkentiger #bizzy #비지 #현대카드언더스테이지 #itaewon #용산구 #내바로앞에서 #랩 #두근두근 #우상 #팬 #발라버려 #스트레스 타이거jk 어렸을때부터 드렁큰타이거 광팬이었던 나.. 근데 jk가 내 바로앞에서 랩을 하시다니ㅜㅜ 우워ㅜㅜ 미래누나하고는 다른느낌 리쓰퐥!! MFBTY continued with Drunken Tiger’s classics such as “Good Life,” “I Want You” and “Monster” before heading off to YoonMiRae’s world with “Angel,” “Black Happiness,” “Soul Flower” and “Pay Day.” Finally, they came together in Wondaland’s space by performing “Sweet Dream,” “Get It In” and “Bang Diggy Bang Bang,” hyping the crowd even more. Combined with a talented acoustic instrument team, MFBTY delivered a memorable show for fans. In March this year, MFBTY’s first full album, Wondaland, was released. To much surprise to the fans, the genres included in the album varied from Hip hop to rock as well as electronic, garnering extremely positive reviews from fans all over the world. The MFBTY members are planning to concentrate on their individual works going forward. They started on a lighter note, with Tiger complimenting how nice the chairs were and how he was too broke to afford it. Tasha admitted her favorite color is purple, to which the hosts, Eric Nam, & Jimin, tempted her to take the purple chair back to the FGM office (Though we can’t imagine how hard that would be to haul from Seoul to UiJeongBu). The crew have been coordinating their own marketing tactics, and Bizzy admitted he asked fans how to say “Angel,” in their own language. After some light laughs about botched pronunciations, they talked about how “Angel,” came about. The song was sitting in the archives for nearly 4 years, but came alive as they felt it resonated with their recent experiences. The death of Tiger’s father was one of noticeable influence, but Bizzy also went through some family struggles during the year, particularly with his mother. It brought Bizzy back to the death of his grandmother, and the culmination of both thoughts led Bizzy to write to the “Angel” beat, with Tiger and Tasha following. Some mysteries about the music video were also revealed, and while it seemed that the cinematography had deep meaning, we found out the meaning evoked was actually accidental. The famous black angel shot was randomly constructed by Lumpens overnight, and the black and white shot was done moreso for simplicity than emotional response. What fans take away from the video is up to them, and MFBTY is all for open interpretation. Fans were later invited to ask questions to MFBTY directly, but we have to thank Julisa from Texas for having the best request. A few days ago, Feel Ghood Music released two pieces of hidden camera footage (here and here) of Tiger dancing to a beat made by producer, KonDQuest. The fam jokes often of Tiger’s “funky” moves, and Julisa was thankful for FGM’s shared video. She requested an encore; Tiger obliged. 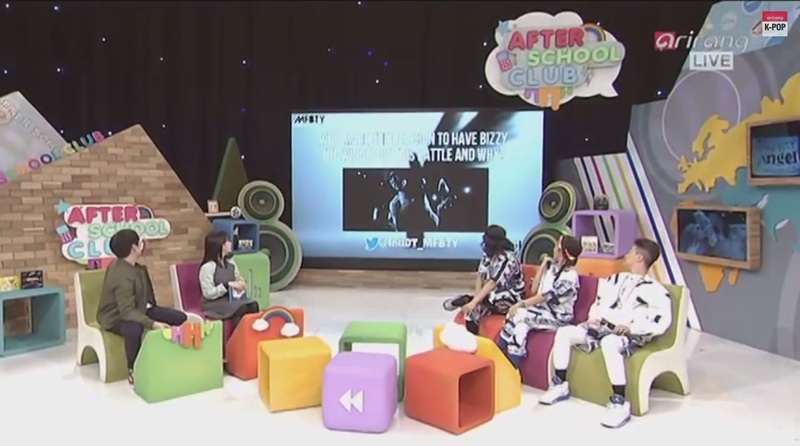 Arirang confessed later that they also interviewed MFBTY’s managers about them. The management team only consists of two people, so the load they endure is not light. The group was at first excited to hear what they would say, but just like the rest of the fam, their managers were honest… brutally honest. The management are MFBTY’s ride home to Uijeongbu, and we have a feeling that 1.5 hour ride was very very awkward. 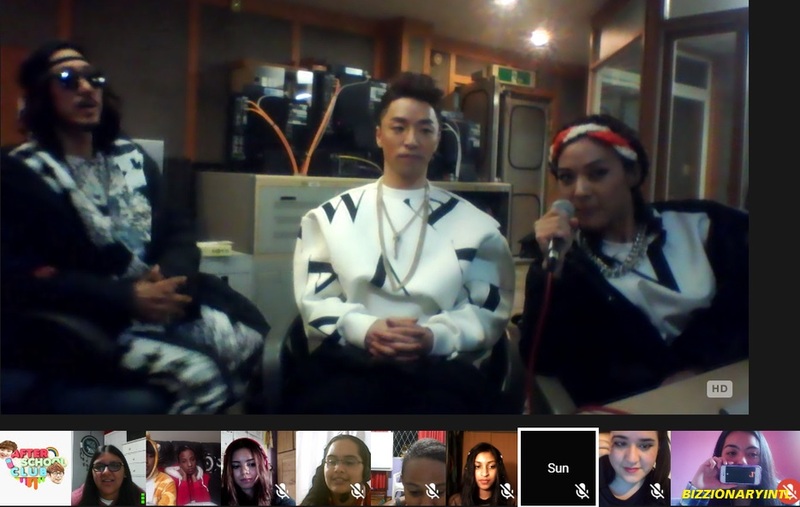 On a happier note, sister site, BizzionaryINTL, was lucky enough to be in the personal hangout with MFBTY. While the show didn’t let admin, Nisa, ask questions on air, she shared with us this post interview shot of her talking with Bizzy and MFBTY directly. It was their technical first time “seeing” each other, and Bizzy being the quiet one he is, had to be teased by Tasha and Tiger to open up more to the head of his fanbase. She asked who his angel was, and the answer was as you would expect. There were many other great moments from last night that words cannot explain. See the awesomeness again at Arirang’s Youtube channel. P.S. These were the greatest fans we caught in the online audience. Can we nominate them for an Oscar? KoreAm & Audrey Magazine’s joint end of year gala, “Unforgettable,” boasts of some impressive guests from the Asian-American scene. Our trio were their headlining act last year, but the event is sending us back in time, as this year will mark the first time Yoon MiRae will perform solo in nearly 10 years. However, the sight will only be visible to the privileged and lucky. For those unfamiliar with these type of events, they are red carpet events where they award and showcase some high profile folks. It also has a fundraising twist to it, so tickets can get pricey. A pair of tickets for this one will run you $1000. We don’t know if there are any fans that adventurous (because at that price, you could probably get a roundtrip to Korea), but email us for purchase details if you have the disposable income to throw down. After all, $1000 does get you a great performance line up and a nice 3-course meal. When: Friday, December 5, 2014 @ 5 p.m.
November 16th, 2013 – Approximately 2 years since MFBTY crew has rocked a US show. Given the rarity the crew do shows in the US, there’s always some nervousness about how the show will go, the turn out, how fans will react. The legacy of Tiger JK is 20 years old, Drunken Tiger 14 years, Tasha 16 years, and Bizzy, the youngest… at 9 years. Most artists are lucky to stay relevant more than 2 years in the industry, but even over such a long period of time, the 3 are able to bring over 2500 people together for a show. Kollaboration traditionally is a celebration of Asian-Americans in entertainment. Kollaboration Star focused on bringing together the show’s best performers from across the country. While the finalists brought a number of their own following, there was no doubt an overwhelming Drunken fan presence in the audience. Given Tiger’s long musical history, the age group spanned from fans in their teens and into their 30s. Both were equally filled with excitement, some waiting nearly 14 years to see Tiger perform live. A week before the show, the crew hinted in on Twitter of a set consisting of old school classics and new songs. However, no one could have expected a DT2 classic, “Drunken Symphony,” to be the intro to the set. Bizzy and Tiger then took us 8 years forward, doing a small rendition of “내눈을 쳐다봐,” from the album. The crew admitted that they rehearsed religiously for a month straight. Although they had 3 full rehearsals at the venue as well, they were filled with nerves. A personal twist was them doing almost the entire audience interaction in English, a treat for the most multiracial audience they have had Stateside. There is so much to rave about this whopping 2 hour and 20 minute set, including a surprise guest performance by Styliztik Jones on “Jet Pack,” an attempted new song over a Snoop Dogg instrumental, a guest collaboration with David Choi for the reggae version of “The Cure,” and the first time the crew did “첫눈이 오면 설레었던 꼬마아이 (Time Travel)” live. However, only the photos and the videos can speak to that. P.S. The show was followed by a private meet and greet for fans who paid for the limited $200 Ultimate Fan package. There was an era where I jumped on a plane once or twice a year to make it to a Drunken Tiger concert. Face it, international gigs are a rarity for Korean artists, so diehards come far and wide to see their fave artists perform. I can only imagine who and what the November 16th show of Kollaboration star will bring. With a full one hour set, this is a show that no DT fan should miss. “Kollaboration Star”, an annual talent competition bringing in Asian talents from all over North America, is back for a second year this year. Six finalists, five of them selected based on an online vote out of thirteen city representatives of local Kollaboration talent contests, will be competing for the national title of Kollaboration Star 2013 and a $20,000 Grand Prize. This year’s competition will also be hosted by YouTube comedian David So, with guest appearances from Paul “PK” Kim and Kollaboration alumni Mike Song and KRNFX. “Kollaboration Star 2013″ will be held on Saturday, November 16th at the Pasadena Civic Auditorium. Presage packages are currently on sale, with official sales starting October 10th. Presley packages can be accessed at http://www.kollaboration.org/presale. The ultimate fan package offers the best opportunity to spend quality time with the three artists. As it includes priority seating,rehearsal viewing, and a private meet and greet ($200). Toaccess the package, type in SOOMPISTAR. These packages will only be available until October 8th.